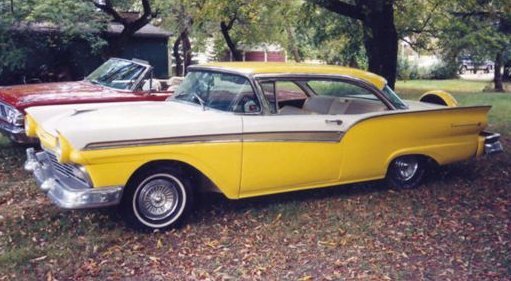 Yellow and white '57 Ford Fairlane 2 Door Hardtop with yellow and white interior. This is a real decent car needing TLC, it has had a custom interior that needs cleaning and small repair, the body and paint were done a few years ago and it was an amateur job slowing flaws. It is an automatic car with power steering, it runs good but could use tires, brake work and a little TLC. The stainless is all good but the front and rear bumpers need re-chroming. The main floors, body mounts and trunk floors are solid. Until now the car has basically been stored the past ten years. This Website was created by Orness Creations. Email any questions or comments to webmaster.